Studio 215 is a fun space where creatives can learn, experiment, build their portfolios, and work on their projects. Studio 215 was opened a year ago. Within Studio 215 is Color Pop Studio, Jasmine’s personal studio where she does workshops and shoots for other people. 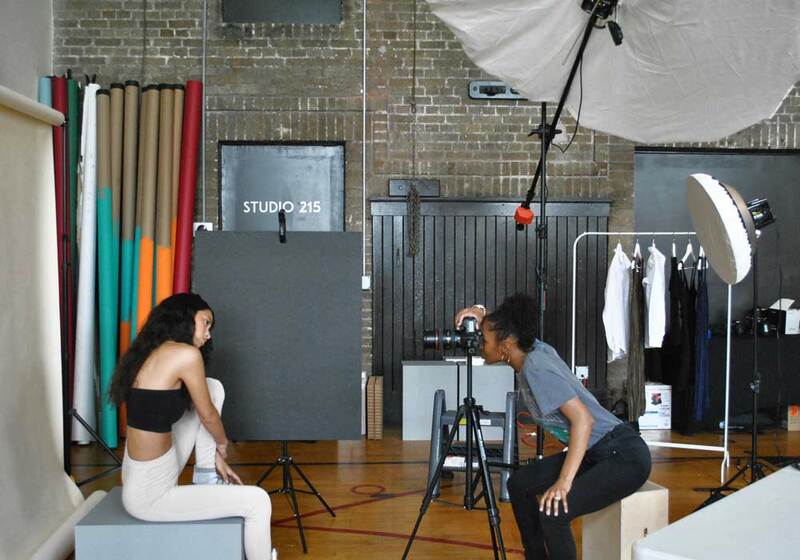 With Studio 215, Jasmine provides a space where creatives can shoot, build their portfolios and, of course, have fun. The studio is actually an old gymnasium that was part of an old Walnut Hills Elementary School, now turned apartments. A stage in the gymnasium, now serving as Jasmine's bedroom. The studio can be rented half-day, full-day, or hourly. The rates are listed on the website, or you can contact Jasmine directly to negotiate (talk budget, if you know what I’m sayin). Jasmine's living room and lounging space. “Studio 215 is an event space or creative space for any type of creators to come and enjoy themselves and be creative,” Jasmine says. The place is perfect for more smaller, personal events and workshops. And who wouldn't be successful with an experimental workshop like Studio 215?